Download "RETAIL : OFFICE : INDUSTRIAL. 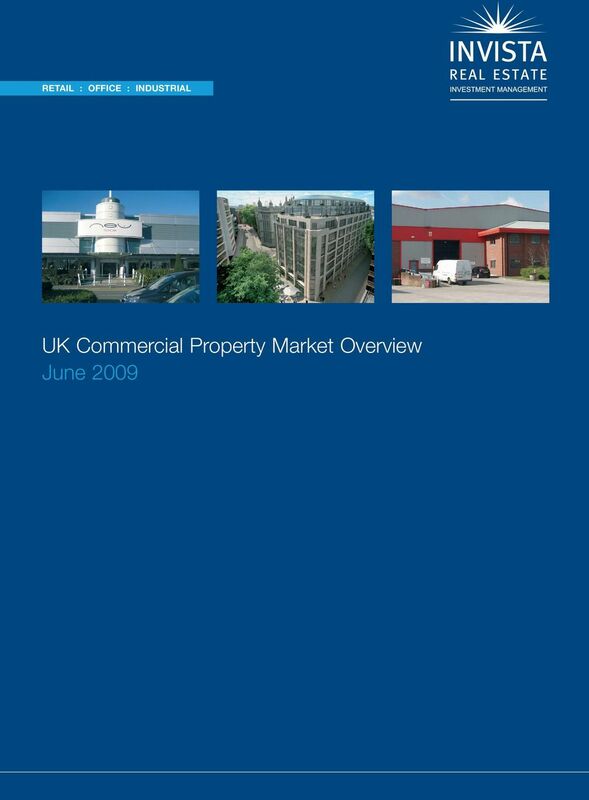 UK Commercial Property Market Overview June 2009"
2 MARCH 2009 UK Commercial Property Market Overview June KEY HIGHLIGHTS Total returns fell by 7.1% over Q according to the IPD Quarterly Index, driven by the 8.7% fall in values 1. However, there is some evidence that capital values appear to be stabilising with the smaller Monthly Index sample reporting that values fell by just 6.8% over the 3 months to end May 2. Rental values are falling but the prospects are encouraging for a quicker recovery than was seen in the 1990s, as the current contraction in rental values is being driven largely by the economic downturn rather than a glut of new space in the market. Property market yields have risen sharply and now appear relatively attractive compared to government bonds. There are, nevertheless, two main caveats: that the impact of the economic downturn has yet to be fully realised in the occupational market; and that we are assuming no more major shocks to the system. 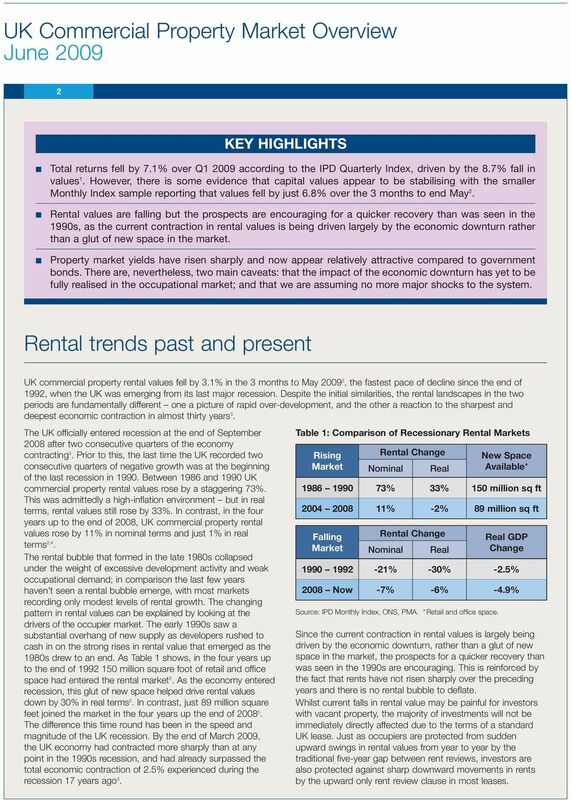 Rental trends past and present UK commercial property rental values fell by 3.1% in the 3 months to May , the fastest pace of decline since the end of 1992, when the UK was emerging from its last major recession. Despite the initial similarities, the rental landscapes in the two periods are fundamentally different one a picture of rapid over-development, and the other a reaction to the sharpest and deepest economic contraction in almost thirty years 3. The UK officially entered recession at the end of September 2008 after two consecutive quarters of the economy contracting 3. Prior to this, the last time the UK recorded two consecutive quarters of negative growth was at the beginning of the last recession in Between 1986 and 1990 UK commercial property rental values rose by a staggering 73%. This was admittedly a high-inflation environment but in real terms, rental values still rose by 33%. 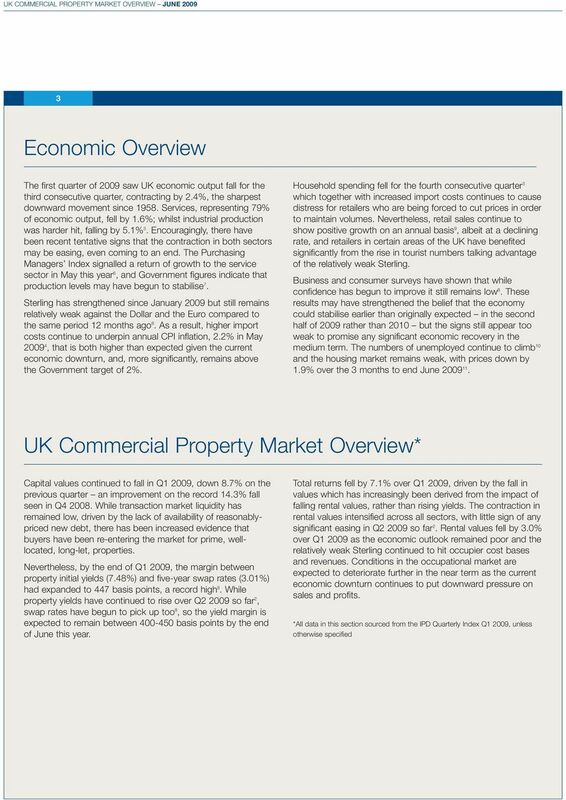 In contrast, in the four years up to the end of 2008, UK commercial property rental values rose by 11% in nominal terms and just 1% in real terms 2,4. The rental bubble that formed in the late 1980s collapsed under the weight of excessive development activity and weak occupational demand; in comparison the last few years haven t seen a rental bubble emerge, with most markets recording only modest levels of rental growth. The changing pattern in rental values can be explained by looking at the drivers of the occupier market. The early 1990s saw a substantial overhang of new supply as developers rushed to cash in on the strong rises in rental value that emerged as the 1980s drew to an end. As Table 1 shows, in the four years up to the end of million square foot of retail and office space had entered the rental market 5. As the economy entered recession, this glut of new space helped drive rental values down by 30% in real terms 2. In contrast, just 89 million square feet joined the market in the four years up the end of The difference this time round has been in the speed and magnitude of the UK recession. By the end of March 2009, the UK economy had contracted more sharply than at any point in the 1990s recession, and had already surpassed the total economic contraction of 2.5% experienced during the recession 17 years ago 3. Table 1: Comparison of Recessionary Rental Markets Rising Market Rental Change Nominal Real Source: IPD Monthly Index, ONS, PMA. *Retail and office space. New Space Available* % 33% 150 million sq ft % -2% 89 million sq ft Falling Market Rental Change Nominal Real Real GDP Change % -30% -2.5% 2008 Now -7% -6% -4.9% Since the current contraction in rental values is largely being driven by the economic downturn, rather than a glut of new space in the market, the prospects for a quicker recovery than was seen in the 1990s are encouraging. This is reinforced by the fact that rents have not risen sharply over the preceding years and there is no rental bubble to deflate. Whilst current falls in rental value may be painful for investors with vacant property, the majority of investments will not be immediately directly affected due to the terms of a standard UK lease. Just as occupiers are protected from sudden upward swings in rental values from year to year by the traditional five-year gap between rent reviews, investors are also protected against sharp downward movements in rents by the upward only rent review clause in most leases. 5 UK Commercial Property Market Outlook 5 There has been a noticeable thawing in the near-term outlook for UK commercial property; not just in the trade press, but also from the commercial property derivatives market. This change in sentiment appears to have been driven by an increasing economic optimism that the recession may be over earlier than previously thought and tangible signs that buyers, particularly from overseas, have begun to re-enter the UK commercial property market. Market volatility may have eased and economic sentiment may have improved, but there still remains significant uncertainty about how much further the economic downturn has to run. So far, the bank and consumer responses to Government and Bank of England actions to restore liquidity, confidence and positive growth to the wider economy, have been relatively positive. Yet, despite this, confidence and activity levels ultimately remain historically low. Until now, the increases in property yields have been indiscriminate of the quality of the asset; but this may have finally come to an end. Foreign investors, in particular, have begun purchasing prime assets in the City, taking advantage of the relatively high yields and the relatively weak Sterling. Indeed, yields on prime, well-located, long-let, properties, not just in the City but across the UK, appear to have stabilised in some cases, even begun to fall. Yields on more secondary properties, however, are expected to continue to rise over The post credit crunch lack of debt finance has led to a historically low development pipeline, particularly larger projects in the Central London office market and shopping centres. However, any positive effects of the resulting lack of supply of new space on rental values are not expected to outweigh the negative effects from the ongoing weak occupier demand. Rental values are therefore expected to continue to fall but, as highlighted earlier, we believe they are unlikely to see a repeat of the prolonged decline witnessed in the early 1990s: the underlying economic fundamentals (inflation and bank rates) are much lower, and the near term supply pipeline less imposing. Further falls in rental values are unavoidable in light of the depth and speed of the current economic contraction, yet there is reason to believe that rental values may stop falling within 12 months of the stabilisation in the broader economy. 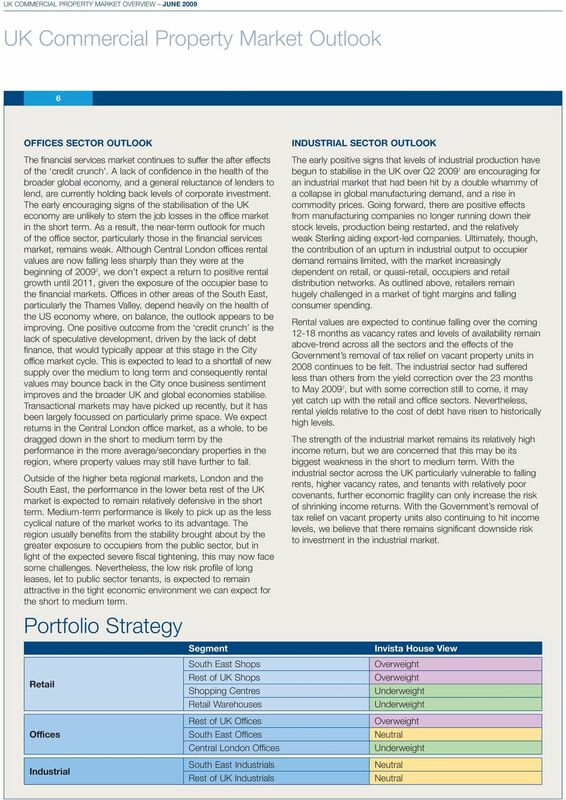 As investors begin returning to the market, so prime property, and the less volatile property, ie lower beta, sectors such as regional offices and industrial market are looking the best prospect for the coming 12 months. Beyond the middle of 2010, as the economy is expected to return to some positive growth, the higher beta sectors, such as Central London offices, should return to favour. The commercial property market is, in our view, now looking good value as an investment, with yields where they are. There are, nevertheless, two main caveats: that the impact of the economic downturn has yet to be fully realised in the occupational market; and that we are assuming that we have seen the last major shock of this credit crunch. RETAIL SECTOR OUTLOOK Household spending has been contracting on a quarterly basis since April , and at an increasingly negative rate in the last three quarters. This has largely been driven by a change in sentiment as the continued weakness of the housing market and fears over job security force consumers to repair their balance sheets. This trend is expected to continue with rising unemployment likely to restrain household spending over the next 12 months. Although retail sales volumes have continued to grow on an annual basis, this masks heavy falls in household goods stores and other specialist shops, and a slight dip in food stores. In terms of money in the till high street stores have had to continue discounting heavily, with only food stores seeing positive growth in sales values over the last 12 months 4,9. Undoubtedly, retailers and their margins remain under severe pressure and investors are growing increasingly nervous about whether their retailer occupiers can withstand further pressure on sales and costs. 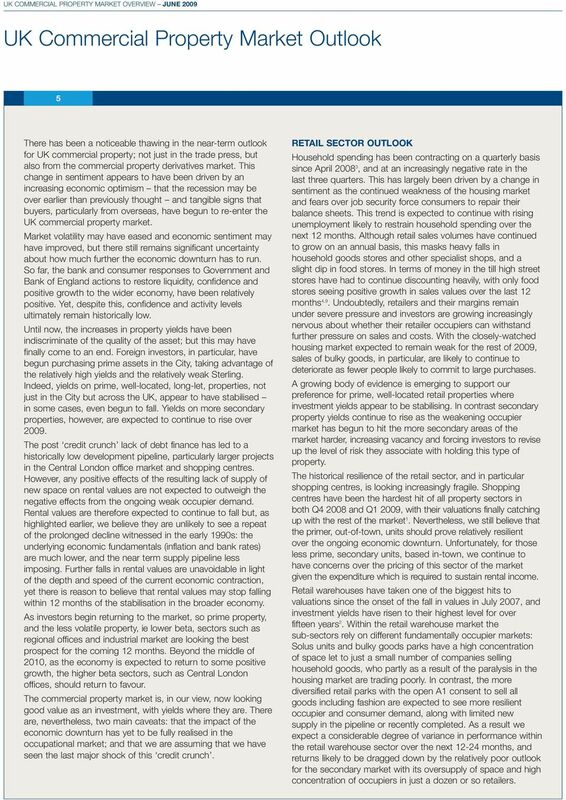 With the closely-watched housing market expected to remain weak for the rest of 2009, sales of bulky goods, in particular, are likely to continue to deteriorate as fewer people likely to commit to large purchases. A growing body of evidence is emerging to support our preference for prime, well-located retail properties where investment yields appear to be stabilising. In contrast secondary property yields continue to rise as the weakening occupier market has begun to hit the more secondary areas of the market harder, increasing vacancy and forcing investors to revise up the level of risk they associate with holding this type of property. The historical resilience of the retail sector, and in particular shopping centres, is looking increasingly fragile. Shopping centres have been the hardest hit of all property sectors in both Q and Q1 2009, with their valuations finally catching up with the rest of the market 1. Nevertheless, we still believe that the primer, out-of-town, units should prove relatively resilient over the ongoing economic downturn. Unfortunately, for those less prime, secondary units, based in-town, we continue to have concerns over the pricing of this sector of the market given the expenditure which is required to sustain rental income. Retail warehouses have taken one of the biggest hits to valuations since the onset of the fall in values in July 2007, and investment yields have risen to their highest level for over fifteen years 2. Within the retail warehouse market the sub-sectors rely on different fundamentally occupier markets: Solus units and bulky goods parks have a high concentration of space let to just a small number of companies selling household goods, who partly as a result of the paralysis in the housing market are trading poorly. In contrast, the more diversified retail parks with the open A1 consent to sell all goods including fashion are expected to see more resilient occupier and consumer demand, along with limited new supply in the pipeline or recently completed. As a result we expect a considerable degree of variance in performance within the retail warehouse sector over the next months, and returns likely to be dragged down by the relatively poor outlook for the secondary market with its oversupply of space and high concentration of occupiers in just a dozen or so retailers. 7 Notes The data contained in this document is for information purposes only. It is correct to the best of our knowledge at the date of issue and may be subject to change. The client legal agreement will take precedence over this document. This document is not legally binding and no party shall have any right of action against Invista in relation to the accuracy or completeness of the information contained in it or any other written or oral information made available in connection with it. Any forecast, projection or target where provided is indicative only and is not guaranteed in any way. Invista Real Estate Investment Management Limited accepts no liability for any failure to meet such forecast, projection or target. 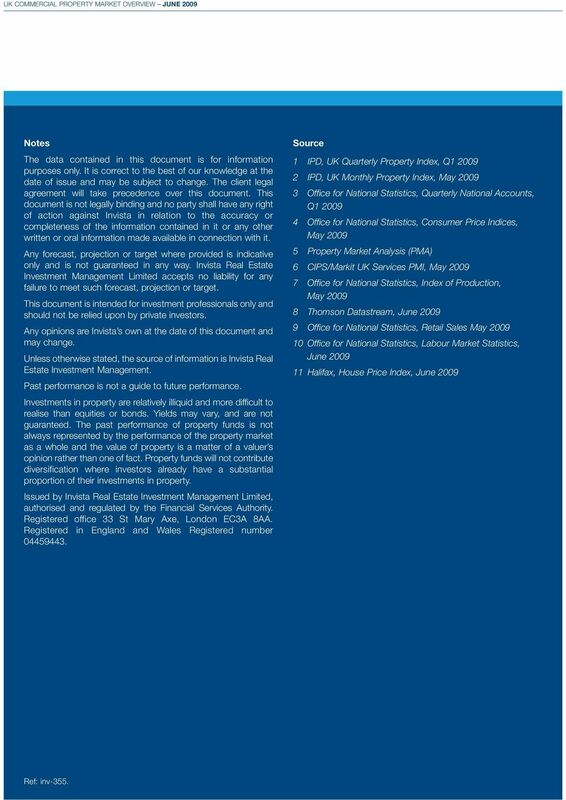 This document is intended for investment professionals only and should not be relied upon by private investors. Any opinions are Invista s own at the date of this document and may change. Unless otherwise stated, the source of information is Invista Real Estate Investment Management. Past performance is not a guide to future performance. Investments in property are relatively illiquid and more difficult to realise than equities or bonds. Yields may vary, and are not guaranteed. The past performance of property funds is not always represented by the performance of the property market as a whole and the value of property is a matter of a valuer s opinion rather than one of fact. Property funds will not contribute diversification where investors already have a substantial proportion of their investments in property. Issued by Invista Real Estate Investment Management Limited, authorised and regulated by the Financial Services Authority. Registered office 33 St Mary Axe, London EC3A 8AA. Registered in England and Wales Registered number Source 1 IPD, UK Quarterly Property Index, Q IPD, UK Monthly Property Index, May Office for National Statistics, Quarterly National Accounts, Q Office for National Statistics, Consumer Price Indices, May Property Market Analysis (PMA) 6 CIPS/Markit UK Services PMI, May Office for National Statistics, Index of Production, May Thomson Datastream, June Office for National Statistics, Retail Sales May Office for National Statistics, Labour Market Statistics, June Halifax, House Price Index, June 2009 Ref: inv-355. 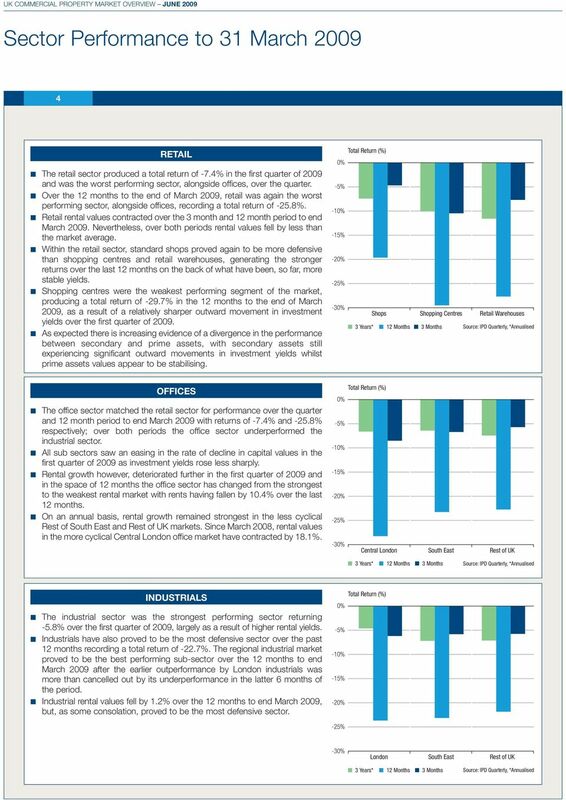 Q4 Quarterly Update January 2014 Lothbury Property Trust Review of 2013 Investment Management Overview Lothbury Property Trust Fund Description Lothbury is an offshore Trust investing in UK real estate. Investment Bond. Funds key features. This is an important document. Please keep it safe for future reference. What can property offer an institutional investor? Ten reasons to be invested in European Listed Real Estate Executive Summary At Petercam Institutional Asset, we are convinced that investing part of one s assets in European listed real estate makes sense. Investment insight. Fixed income the what, when, where, why and how TABLE 1: DIFFERENT TYPES OF FIXED INCOME SECURITIES. What is fixed income? The U.S. Economy after September 11. 1. pushing us from sluggish growth to an outright contraction. b and there s a lot of uncertainty. interim report 2004June 30, 2004 Macroeconomic trends In the first quarter of 2004, the euro-area economy grew 0.6% sequentially. This represented a faster pace of growth than in the previous quarters. TIMING YOUR INVESTMENT STRATEGIES USING BUSINESS CYCLES AND STOCK SECTORS. Developed by Peter Dag & Associates, Inc.